I get very excited when I am able to identify a new moss. This is mainly due to the fact that moss ID is one of my weakest points. I was sitting down on a rock the other day taking a break from vegetation surveys when I looked to my right and saw something peculiar. The area was pretty sloped and there was some exposed soil in the vicinity. Covering some of that soil was what looked like green fuzz. Embedded in that fuzz were these strange green urns. I busted out my hand lens and got a closer look. This was definitely a moss but one I had never seen before. The urns turned out to be capsules. Later, a bit of searching revealed this to be a species of moss in the genus Diphyscium. This genus is the largest within the family Diphysciaceae and here in North America, we have two representatives - D. foliosum and D. mucronifolium. These peculiar mosses have earned themselves the common name 'powder gun moss.' The reason for this lies in those strange sessile capsules. 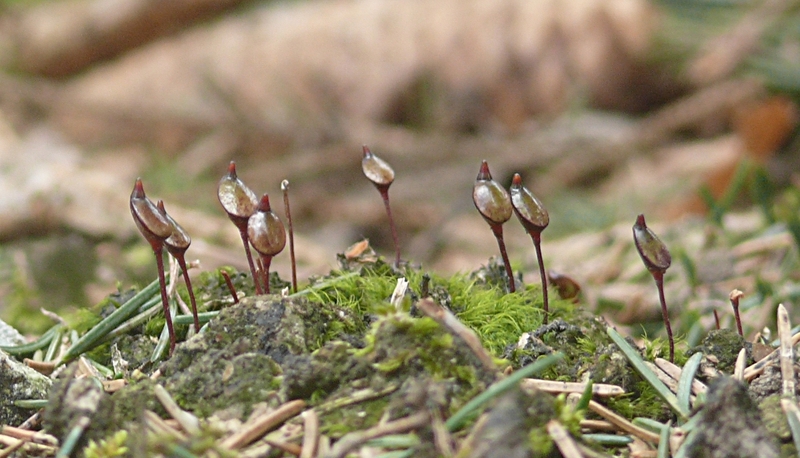 Unlike other mosses that send their capsules up on long, hair-like seta in order to disperse their spores on the faintest of breezes, the Diphyscium capsules remain close to the ground. In lieu of wind, a powder gun moss uses rain. In much the same way puffball mushrooms harness the pounding of raindrops, so too do the capsules of the powder gun moss. Each raindrop that hits a capsule releases a cloud of spores that are ejected into an already humid environment full of germination potential. Luckily for moss lovers like myself, the two species of Diphyscium here in North America tend to enjoy very different habitats. This makes a positive ID much more likely. D. foliosum prefers to grow on bare soils whereas D. mucronifolium prefers humid rock surfaces. Because of this distinction, I am quite certain the species I encountered is D. foliosum. And what a pleasant encounter it was. Like I said, it isn't often I accurately ID a moss so this genus now holds a special place in my mind. For all the attributes we apply to the world of bryophytes, height is usually not one of them. That is, unless you are talking about the genus Dawsonia. Within this taxonomic grouping exists the tallest mosses in the world. Topping out around 60 cm (24 inches), Dawsonia superba enjoys heights normally reserved for vascular plants. Although this may not seem like much to those who are more familiar with robust forbs and towering trees, height is not a trait that comes easy to mosses. To find out why, we must take a look at the interior workings of these lowly plants. Mosses as a whole lack the vascularization of more derived plants. In other words, they do not have the internal plumbing that can carry water to various tissues. 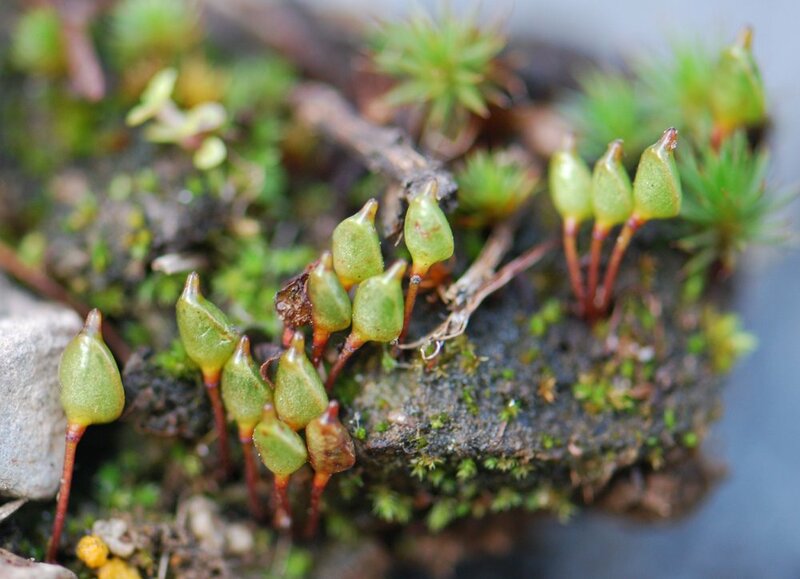 Coupled with the lack of a cuticle, this means that mosses are quite sensitive to water loss. For most mosses, this anatomical feature relegates them to humid environments and/or a small stature. This is not the case for Dawsonia. Thanks to a curious case of convergent evolution, this genus breaks this physiological glass ceiling and reaches for the sky. Unlike other mosses, Dawsonia have a conduction system analogous to xylem and phloem. Being convergent, however, it isn't the same thing. Instead, the xylem-like tissue of these mosses is called the "hydrome" and is made up of cells called "hydroids." The phloem-like tissue is called the "leptome" and is made up of cells called "leptoids." These structures differ from xylem and phloem in that they are not lignified. 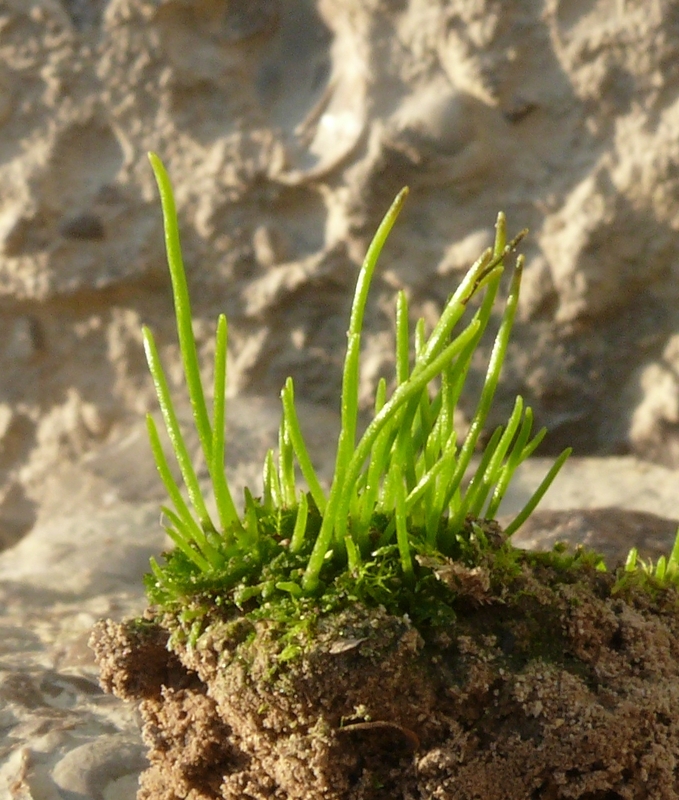 Mosses never evolved the ability to produce this organic polymer. Regardless of their chemical makeup, Dawsonia vascular tissue allows water to move greater distances within the plant. Another major adaption found in Dawsonia has to do with the structure of the leaves. Whereas the leaves of most mosses are only a few cells thick, the leaves of Dawsonia produce special cells on their surface called "lamella." These cells are analogous to the mesophyll cells in the leaves of vascular plants. They not only function to increase surface area and CO2 uptake, they also serve to maintain a humid layer of air within the leaf, further reducing water loss. All of this equates to a genus of moss that has reached considerable proportions. Sure, they are easily overtopped by most vascular plant species but that is missing the point. Through convergent evolution, mosses in the genus Dawsonia have independently evolved an anatomical strategy that has allowed it to do what no other extant groups of moss have done - grow tall.